J. W. “Blind” Boone Residence - PWArchitects, Inc. The J.W. “Blind” Boone Residence is a significant part of Columbia’s history. The recognition of this building lies not only in the memory of the native Missouri artist, pianist, and philanthropist John William Boone but also in the history of the African-American community in Columbia. In recent years, the residence had fallen into disrepair. PWA was hired to study the historic structure and to make recommendations for its preservation and reuse. Architectural services provided for the project included investigation of historic building elements, as well as basic structural, mechanical, electrical, and materials systems. PWA also assisted public groups in visioning an adaptive use for the facility to maintain its viability in the community. 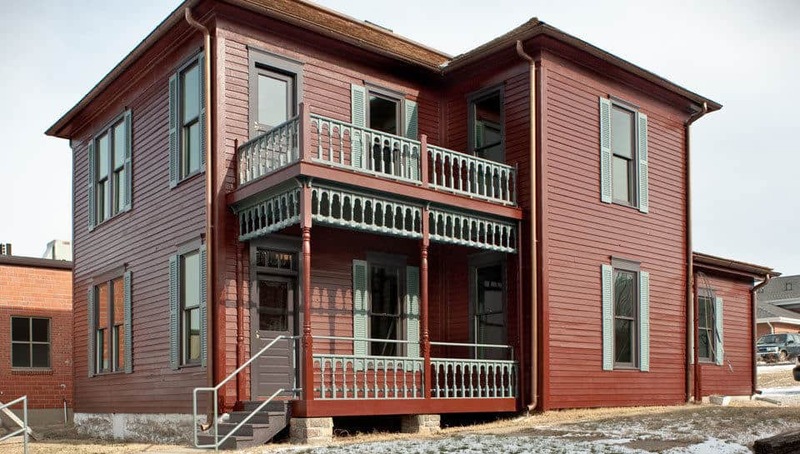 The project team researched historic documentation of the house to provide knowledge of appropriate repair and replacement strategies so that the house regained its original authenticity. In cooperation with various civic and governmental entities, PWA helped envision possible futures for the building and site that would appropriately honor one of Missouri’s historic figures, while also maintaining connections to the music appreciation and African-American communities in Columbia. The proposed solution includes a complete restoration of the home by removing unauthentic additions, and the construction of a small performing arts center adjacent to the house. The new facility allows for ancillary functions and meetings without disrupting the authentic character of the original house.